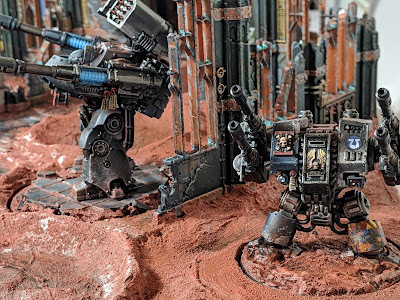 Adepticon is a week and a half away, so it only seems fitting that today's Miniature Monday is all about the display board I built for the Warhammer 40,000 Friendly tournament. Last year was my first attempt at doing a display board, and while I was fairly happy with it it wasn't the greatest. 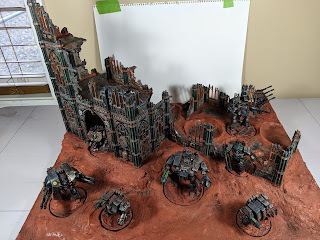 That board needed to house 1,500 points of Adeptus Mechanicus and there wasn't a whole lot of room on it for creativity on a 24"x24" board. 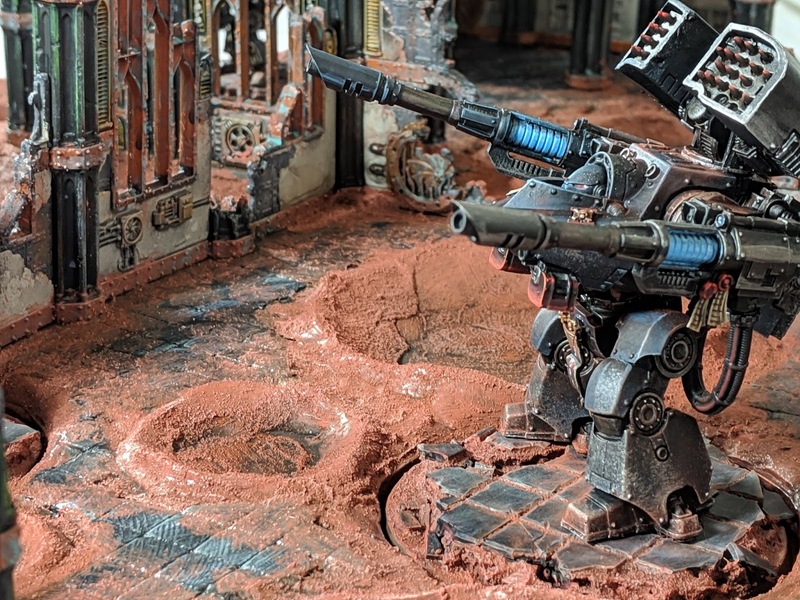 This year I decided to do an all dreadnought list, which ended up being all of 8 models. This also meant that I could play with the look of my board a bit and even make the overall footprint of the board smaller too. I luckily had a spare piece of MDF left over which was roughly 18"x24". 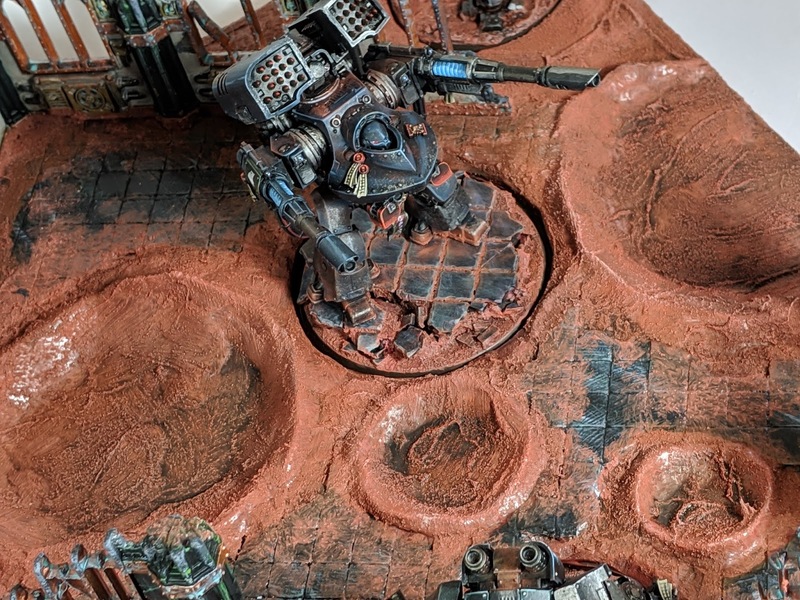 I had originally planned to use Sector Imperialis Ruins and leftover Aegis Defense Line barricades on the board and leave it fairly flat, except for a raised platform in the back half. This plan was OK, but I tossed it to the side after a few days of playing with it. I wasn't a fan of the overall flatness of the board or with the way that the Chaplain's original base looked on it. This resulted in two big changes. 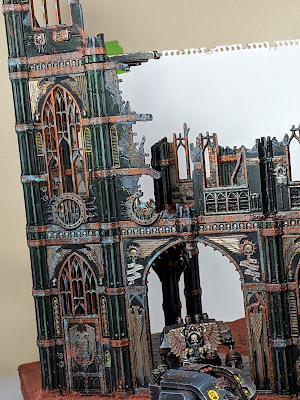 The first, I switched up the board to include more Sector Imperialis ruins, and after purchacing the Kill Team box set I had that part covered. The second, I popped the Chaplain Dreadnought off of the fancy base he was on and put him on a standard base instead. The base he was on didn't fit with the look I was going for. 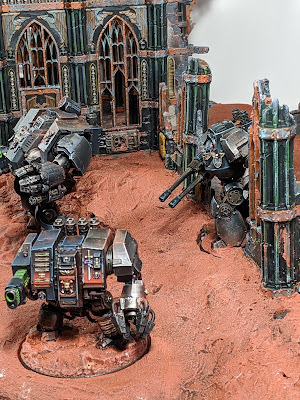 But, ironically I had already tiled the Contemptor and Deredeo's bases, so it still played a part in the overall direction the board went. The new board design was built on top of the MDF base using pink insulation foam and 3/16" foamcore board. The foamcore was laid two layers thick, which allowed me to make the craters deeper and give me space to recess some of the models bases. One thing I learned from last year's board is that while the texture paint will act as a gap filler, it will sometimes still leave noticeable seams where layers meet. On this one I solved that issue by using Milliput to act as a filler and transition from one layer to another. It took 3 full packs of Milliput to do all the craters and hills, but it was totally worth it. The Mars soil effect was done by mixing Tuskgor Fur Citadel paint with Liquitex Texture Medium. 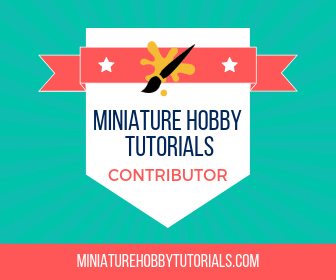 I mix together 3 pots of Tuskgor Fur and 2 tubes of texture medium in an olive jar. 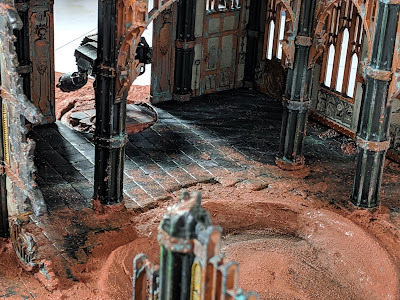 This mixture lasts a long time too, the current batch I mixed in late 2018 and have used it for multiple models and terrain. When I finished this board, I still had 1/3 of it left in the jar. 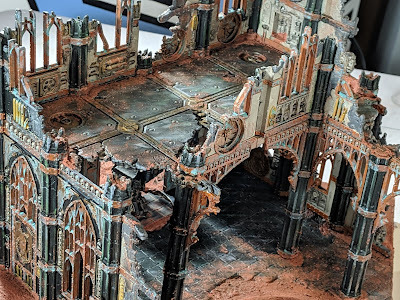 The ruined cathedral was made using the terrain from the Kill Team box set and a spare set of Sector Imperialis Ruins. I spent a lot of time trying to figure out what color to paint it, and kept coming up short. Finally it hit me that I should make a reference to my Adeptus Mechanicus army and went with a green, beige and copper color scheme. The green sides were painted by drybrushing Caliban Green, Warpstone Glow and Moot Green over top of a black primer coat. The trim and details were painted with a bunch of different metallics such as Screaming Bells, Balthazar Gold, Leadbelcher and Skulltaker Brass. Holy crap is that terrain detailed. It took me a solid 3-4 days of painting base coats just to cover it all. The windows in particular were a pain to do and they ended up ruining a brush in the process. After it was all painted, it looked gaudy as all Hell. Luckily it was all toned down after a Nuln Oil wash.
That was a tricky task, trying to hold on to it and wash it at the same time! 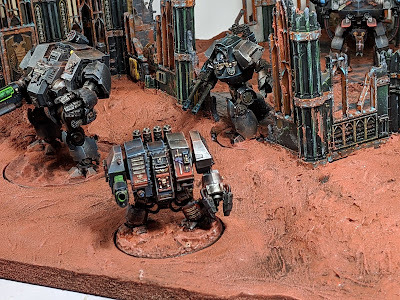 For weathering, I drybrushed the entire thing with Screaming Skull, used Ryza Rust dry paint on all of the silver and Nihilakh Oxide in the recesses of all the copper/gold areas. I'm really pleased with the end result and the dreads look excellent on it! I can't wait to take this to Adepticon for the Friendly and show it off. That's it for now. 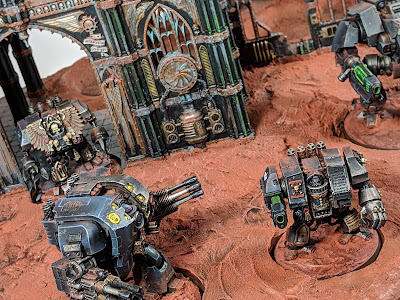 Adepticon is now about a week away and the hype is real!